Peggy back at it again. In the wake of December 2016's fire at DIY Oakland space Ghost Ship that tragically killed 36 people, similar artist-run warehouse spaces across the country began being shut down, presumably out of fear for another unfortunate event. While safety may have been the primary motivation behind these closures, the nationwide trend effectively displaced hundreds of artists, causing many to start over on community-building progress that they'd been making for years. In Baltimore, that space was the Bell Foundry. On December 5, 2016, three days after the Ghost Ship fire, residents of the Central Baltimore warehouse woke up to police officers and city officials forcing them to evacuate without much reason as to why. That was the last day the Bell Foundry, as the city's arts community knew it, was in existence. 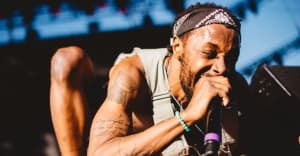 Rising rapper JPEGMAFIA spent much of his time in Baltimore occupying The Bell, as people called it, hanging out and collaborating with local artists. Its closing had a major impact on the community, as it not only served as a safe haven, but also a performance space to counter local venues that were often out of touch when it came to nurturing the scene. The intro on JPEG's well-received Veteran album, "1539 N. Calvert" was The Bell's address and the song pays tribute to a key chapter in Baltimore's DIY history. Today, we're premiering the song's video, which features Peggy hanging out with many artists that frequented the space. “The Bell Foundry doesn’t exist anymore but no one who was a part of the community there will ever forget it," he said through email. "This video is the best recreation of what we experienced there, but in reality, there is no way to convey that on screen. I wish I could put what I feel for The Bell into words but I’m not that smart I guess.” Watch "1539 N. Calvert" above. Read our interview with JPEGMAFIA. Thumbnail image by Alexa Viscius.